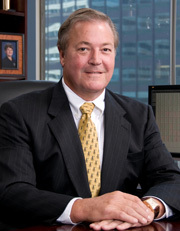 Andy Daniels is the founder and Chief Executive Officer of Daniels Trading. He oversees the daily operations of the firm, while maintaining his own trading, as well as advising several selected, long-established customers. In everything he does, Andy strives to embody the firm’s “Independent. Objective. Reliable.” motto. Well-known on the trading floors of grain exchanges around the world, Andy has accomplished much in a relatively short period of time. Andy began his trading career as a runner on the grain floor of the Chicago Board of Trade. Proving to be a quick study, it took less than a year for Andy to establish himself as an effective force in executing trades on the exchange floor. Shortly thereafter, he began his professional career as a commercial grain merchandiser buying and selling grain from varied sources on behalf of ContiGroup Companies (formerly Contintental Grain). ContiGroup is a recognized leader in integrated pork and poultry production, cattle feeding and aquaculture. It was while serving as a commercial grain merchandiser that Andy began establishing an extensive network of floor traders, brokers and exchange professionals, making his transition into futures brokerage a successful one. In 1986, Andy became a futures broker with Balfour MacLaine, but soon moved to Linnco Futures Group (“LFG”) which could better accommodate Andy’s commercial grain hedging style. From 1986 to 1994, Andy continued to build his reputation as a commodity broker and a grain trader. Just one month after becoming LFG’s Director of Research In May 1994, Andy was named the firm’s Executive Vice President of Sales. Andy decided to take his knowledge of futures brokerage and establish a firm built around the attributes that had created his success. He built Daniels Trading in 1995, selecting his brokers based upon the criteria that he wanted to find the type of brokers with the kind of experience and abilities he himself would most value if he were the customer. Daniels Trading immediately began to see success in this way of doing business. As Daniels Trading continued to grow, Andy saw great opportunities that would ultimately allow the firm to expand the options it provides for its clients and strengthen its resources and services. Andy proactively re-positioned Daniels Trading by forging new clearing relationships with multiple Futures Commission Merchants (FCMs). As a result, Daniels Trading customers now have multiple clearing options to choose from based on their individual needs, along with a bounty of associated services and tools. Having multiple clearing relationships has enabled Andy to leverage the prominence of these firms in the futures community while maintaining the Daniels Trading order desk, firm infrastructure and high broker selection standards that customers have grown to expect and appreciate. With these developments, Daniels Trading continues to evolve and strengthen its ability to deliver on its Mission of Independent. Objective. Reliable.. Among his outside interests, Andy is an avid fly fisherman, hunter and golfer. He is involved in a variety of charitable causes, including leukemia research at St. Jude Children’s Research Hospital, and Outward Bound wilderness-based active learning expeditions.